Photo courtesy of Robert Cutts. The grandiosity of Teatro Colón cannot be ignored. Whether you're walking past, zooming by in a taxi, or one of the lucky ticket holders about to go to a show - the theater's white marble and lavish details demand admiration. Declared a historical monument by the Argentine government in 1989, the theater is a perfect representation and metaphor for the country that worked to build it. Teatro Colón offers a mix of French, German, and Italian style architecture and design, built up with not just a little turmoil and scandal, and is renowned for both its aesthetics and acoustics. Tickets can be hard to come by, but if you can get your hands on some - it is a must see while in Buenos Aires. Today, Teatro Colón is located in the heart of downtown Buenos Aires, among the streets Cerrito, Viamonte, Tucumán and Libertad. 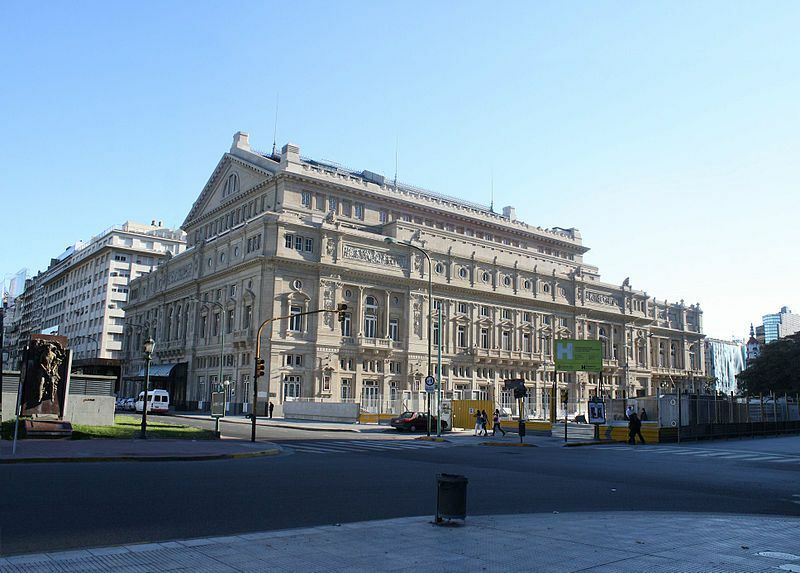 However, this building is actually the second Teatro Colón to exist. The first Teatro Colón stood in front of the Government House (Casa Rosada) between 1857 and 1888, but was replaced when it could not accommodate the shows and audiences of its day. The current theater took some twenty years to construct. Its cornerstone was placed on May 25th, 1890 with hopes to inaugurate the theater October 12th, 1892, the date of the fourth centennial of the discovery of the Americas. However, the main architect, Italian Francesco Tamburini, died suddenly in 1891. His replacement Vittorio Meano, rumored to have been involved in a love triangle, was shot in his home. Belgian architect Jules Dormal finally finished the project, but not until May 25, 1908 when the inaugural performance - Giuseppe Verdi's opera "Aida" was performed. Many decades of performance later, the theater was in need of repairs and renovations. After a few starts and stops, the theater was closed in November of 2006 with plans to re-open in May 2008, for the Colón’s 100th birthday. However, the project grew in budget and scope, jumping from $32 million to over $100 million, and finally re-opened in May 24, 2010, in time for the celebration of Argentina's bi-centennial. Although there was much strife involved in the renovations, including worker strikes and protests, the final result is breathtaking. The theater is seven stories and covers an entire block, offering more than can be seen in just one take. Here are some of the notable spaces in Teatro Colón. Once you've taken in its magnificent exteriors, the theater's foyer continues to impress with gilded pieces, marble, dramatic statues, and stained glass from around the world. The columns are made from reddish Verona marble, Portuguese marble is used for the two lions that guard the central stair case, yellow marble from Siena, and white marble from Carrara can also be found in elements around the foyer. The stained glass windows, representing Homer and Sapho singing a hymn to Apollo, were imported from Paris. The mosaic floors came from Venice. Stadivari and Guarnieri instruments are included in a collection just to the right of the entrance hall. In the style of 19th century Europe, the auditorium takes the shape of an elongated horseshoe. Three rows of boxes, ground floor, balcony, and high boxes)are beneath two 'dress circles', and above them is the upper circles. A giant chandelier is at the center of the auditorium and casts light upon the golds and reds of the upholstery, carpets, curtains, and trim. Deserving its own distinct description, the auditorium ceiling offers a painting from Raul Soldi, a well known Argentine painter. The painting depicts characters of the "Commedia dell' Arte" and includes mimes, goblins, actors, dancers, musicians and more all interacting in a fantastical scene above. - The theater can hold up to 2,478 people sitting, but the shows can also be attended by 500 people standing. - The orchestra pit can hold up to 120 musicians. - The total area of the Teatro Colón is 58,000 m2. - The stage has an inclination of 3 cm per meter, 35.25 m wide, 34.50 m deep and 48 m high. It includes a spinning disk with a diameter of 20.30 m which can be electrically activated to spin in any direction and change the scenes quickly. Having been open since 1908, and regarded as one of the top 5 opera houses in the world, it has enjoyed many famous singers, composers, and dancers. Teatro Colon offers a mix of opera, ballet, concerts, and special events. It is recommended to purchase tickets in advance. You may purchase tickets on Teatro Colon's website at this address: https://www.tuentrada.com/colon/Online/, although it is is Spanish. Guided Tours of the Teatro Colón are available Monday to Sunday, including holidays, from 9:00 am to 5:00 pm and last 50 minutes.